Tropicana, The most spectacular of the cabarets to open sky. 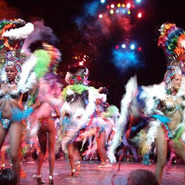 A unique place in the world to enjoy the music and the Cuban and Caribbean folklore in all their color, musicality and rhythm. An art extravaganza to multiply the Cuban happiness of a true tropical night. Book with Havanatur and receive a free seating upgrade!! 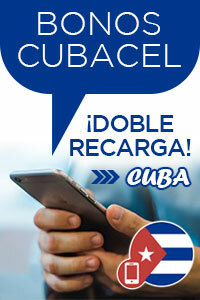 Address: Calle 72 y Línea del Ferrocarril, Marianao, Ciudad de La Habana. 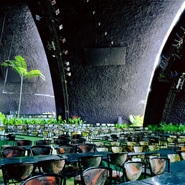 Open air terrace, surrounded by a luxuriant tropical forest, where the fabulous and unique Tropicana shows take place. From 8.30 p.m. untill dawn. Roofed hall reproducing the Cuban countryside at night, where Tropicana shows take place on rainy days. This hall with air-conditioned and great comfort, is ideal for conventions, press conferences, fashion shows, concerts and dances. The chords of the violin and piano, the moon filtering through the glass roof and an encompassing view of the surrounding park confirm the exoticism and sophistication of this luxurious restaurant set where Tropicana casino used to be. 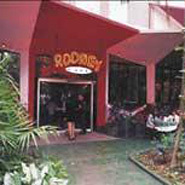 International cuisine, every day from 7.00 p.m. to 12.00 a.m.
Café Rodney, with the modern atmosphere of the 50’s is an immediately captivating bohemian spot. Varied offers and attractive prices, every day from noon to midnight.